A broad range of American musical traditions brings together three virtuosos in Sony Classical's Appalachia Waltz -- cellist Yo-Yo Ma joins double bassist Edgar Meyerand fiddler/violinist Mark O'Connorin this collection of new works by Meyer and O'Connor and innovative arrangements of classic American instrumentals. Appalachia Waltz was released on September 17, 1996. In many of the 16 selections, Ma, Meyer and O'Connor explore the diversity of the instrumental style that emerged among the people of the Appalachia mountain region. This music spread westward to Texas, where it changed and expanded and first drew O'Connor's attention. 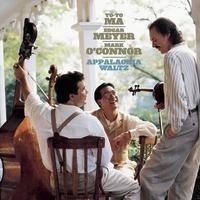 Appalachia Waltz, which was produced by Meyer and O'Connor, also features Meyer as pianist and O'Connor on mandolin. The trio discussed Appalachia Waltz and their unique collaborative effort. "I keep thinking of the word 'band'. I love being in this band," commented Ma. O'Connor said, "Our primary goal to create a new sound somehow that just feels right, sounds right and makes the listener step back and go, 'Why hasn't this been done before?'" Meyer added, "It's not meant to fill any certain niche. It's two things: it's music that people will enjoy listening to -- it's made with an audience in mind. It's also made for the three of us and our desire to learn new things." Ma, Meyer and O'Connor toured together in support of Appalachia Waltz in the fall. Among the stops was a showcase at New York's legendary Bottom Line that was broadcast over Americana, NPR and other radio station formats across the country. Ten-time Grammy Award winner Yo-Yo Ma's fame is built on his reputation as one of the premiere cellists of this century and his continuing legacy of recordings with Sony Classical. Meyer has literally recreated the role of the double bass as a modern virtuoso instrument and in 1994 became the first bassist to win the Avery Fisher Career Grant. He has also developed a highly personal, wide-ranging style as a composer, and often performs and collaborates with pop, country and jazz artists. O'Connor has spent much of his career in country music, where he has been named Musician of the Year five times by the Country Music Association. Last year, O'Connor created a sensation with his best-selling recording The Fiddle Concerto, featuring his original three-movement violin concerto, with himself as soloist, and an original string quartet, in which Meyer also performed. Ma and Meyer, both exclusive Sony Classical artists, can both be heard on Sony Classical's recent recording of Schubert's Trout Quintet (SK 61964), a work they also performed in a "Live From Lincoln Center" concert broadcast on PBS in February, that included an original piece by Meyer. Ma's continuing interest in American music and unique collaborations is also reflected in Concertos from the New World (SK 67173), in which he performs a pair of cello concertos by Dvor?k and Victor Herbert that have their roots in America, Made in America (the music of Gershwin, Bernstein, Kirchner and Ives) (SK 53126), The New York Album (SK 57961) and his ground-breaking and best selling recording with Bobby McFerrin, Hush (SK 48177) which was recently certified as a gold record by the Recording Industry Association of America.